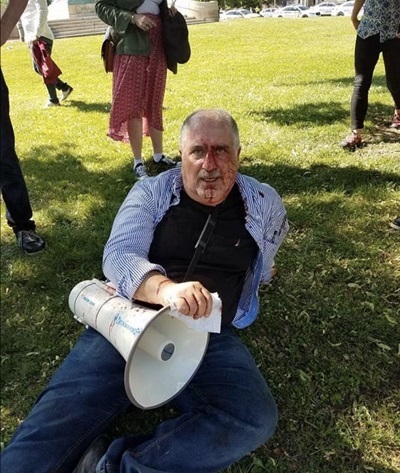 Nine people were hurt and two were detained during an altercation in front of Turkey’s Ambassador to US, Serdar Kılıç’s residence in Washington DC on Tuesday. The official bodyguards of Turkey’s autocratic President Recep Tayyip Erdoğan have also joined the fight. Doug Buchanan, a DC Fire and EMS spokesman, said two of those hurt were seriously injured and were taken to hospitals by ambulance. He said that emergency personnel were called to the residence at about 4:30 p.m. on May 16. A group of pro-Kurdish protesters chanted slogans and carried placards about outlawed Kurdistan Workers’ Party, jailed co-chairs and deputies of pro-Kurdish Peoples’ Democracy Party (HDP) and deputies beside of YPG/YPJ flags. ‘Baby killer Erdoğan,’ ‘Long Live YPG,’ ‘Erdoğan is ISIS, ISIS is Erdoğan,’ ‘ISIS made in Turkey,’ ‘Long Live PYD’ chant the demonstrators who also demand freedom for HDP Co-chairs Selahattin Demirtaş and Figen Yüksekdağ who are jailed since November 2016. Metropolitan Police Department spokesman Dustin Sternbeck said the altercation broke out between two groups but he did not elaborate on the circumstances. He said two people were detained, including one who was charged with assaulting a police officer. 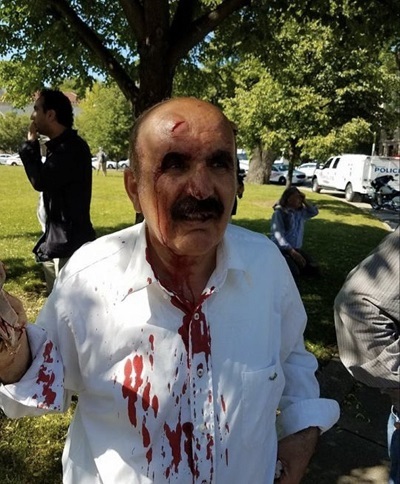 According to Voice of America (VOA), the altercation occurred between pro-Kurdish protesters and supporters of President Recep Tayyip Erdoğan in front of Ambassador Serdar Kılıç’s residence. Video shot by Voice of America also showed men in suits identified as Erdoğan’s bodyguards joining the melee. The altercation came the same day that Erdoğan met US President Donald Trump at the White House. It is not the first time Erdoğan’s bodyguards and fanatics have attacked the critical Turkish citizens. On late March 2016, during a visit of President Erdoğan to Washington DC, Turkish journalists and protesters critical of President Erdoğan were also attacked by presidential bodyguards in Washington as Erdoğan was readying to give a speech at the Brookings Institution. Amberin Zaman, a Turkish journalist with the Woodrow Wilson Center in Washington, had tweeted that a member of Erdoğan’s security details called her a “PKK whore” for standing in the driveway. The PKK is recognized as a terrorist organization by the US, the EU and Turkey. Another journalist Mahir Zeynalov, who was deported from Turkey because of his views critical of the government, had posted a video on Twitter which showed Turkish journalist, Adem Yavuz Arslan, the former Ankara Bureau Chief of Bugün daily, who also resides in the US due to intense pressure from the government, being physically pushed away from the area. US media had said that local police officers rushed in to try to calm the situation, but that some of them warned the Turkish leader’s security guards that they needed to retreat and let the protesters have their say. “You’re part of the problem, you guys need to control yourselves and let these people protest,” US-based Foreign Policy had reported one police officer as saying.